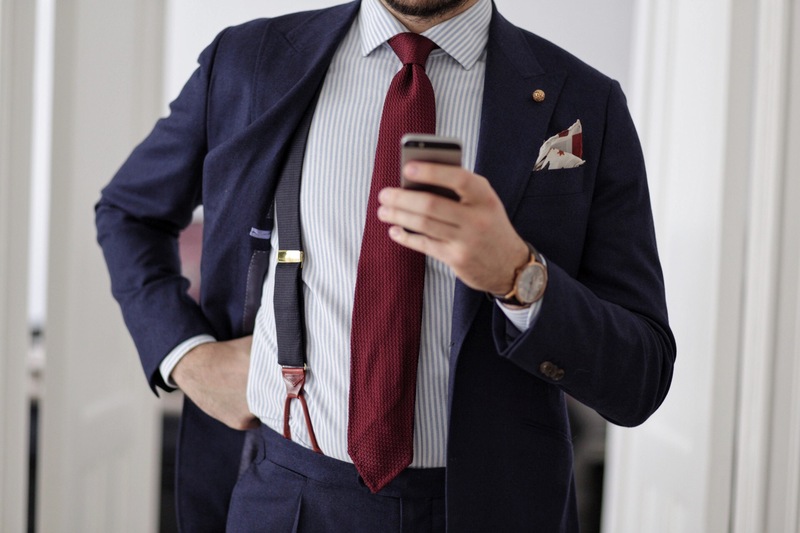 Suspenders or Braces – what’s the difference? There have been several ancestor to braces throughout the past 300 years, but modern braces were first invented in 1820 by Albert Thurston. They were worn, due to the high cut of mid-nineteenth and early twentieth century trousers that made a belt impractical. Which style you choose is a matter of your own personal preference. I prefer the button-on version and a wider model in different materials. It can be a nice detail to match the leather part of your braces with the color of your shoes, but not a must. The trousers for braces have buttons in order to attach the leather tabs; these may be either on the outside or inside of trousers. I prefer the latter. I also think it look better if you don’t have belt loops on the trousers, but this of course is also not a must. Can you use them in business occasions?